Although he would be gutted to see Mark Tyler leave Kenilworth Road, Hatters team-mate Jake Howells could understand if the eventual lure of a return to Peterborough United would be too tough for the keeper to turn down. The 38-year-old shot-stopper spoke out in the press this week, declaring himself ‘gutted’ that Luton had blocked an apparent deadline day return to London Road. Although Town boss Nathan Jones has since denied any official approach was made for his services, Howells can understand why Tyler would be drawn back to a club where he spent 16 years of his career. He said: “I understand completely especially with Tyles’ age and his point in his career where he’s at, what Peterborough means to him, I suppose is what Luton means to me in a way. “They’ve made his career and given him a life to be honest. “I respect any wishes that Tyles does as he’s a brilliant bloke and a brilliant player as well. “Don’t get me wrong, I think everyone would be gutted to see Tyles go, but in the long run if it’s the best thing for Tyles to do in his career and his life, then you’ve got to you hold your hands up and say good luck to him, because he’s been very loyal to us and a brilliant servant to the club. Tyler has made 294 appearances for Luton since joining in 2009, but hasn’t featured for the last three games, after injuring his back during boss Nathan Jones’ first match in charge. 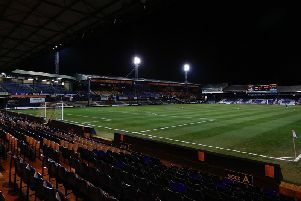 Howells would love to see him remain at Kenilworth Road, but knows everyone within the squad would back him whatever, as he said: “Hopefully he stays, but he needs to do what’s best for him and if he can get something for him at Peterborough and that’s what he needs to do for him and his future, then he’s got to do that. “I think everyone would stand by him and wish good luck to him as he’s been brilliant for us. “Any club would love to have Tyles because he’s a brilliant keeper, whether Luton can try and keep hold of him I don’t know. Howells doesn’t think he would have been having this discussion had it not been Posh who came knocking either, as he said: “I think if would be different if it wasn’t Peterborough that wanted him back, but any club would love to have Tyles at their club. “Peterborough is his home club, he played there for years, so it means something to him. “I don’t know if he is going, but if he does, I wish him the best of luck and hope he does well there. “You’ve just got to respect the person, his life and his lifestyle, he’s got to choose his career wisely. “Tyles is a clever enough man to decide what’s best for his future. Ultimately he wants to play football for as long as he can, he knows that and whether it goes into coaching, who knows, I don’t know where it goes for Tyles from here. Elliot Justham has been handed the gloves for the last three games, and Howells believes the club is in good hands should Tyler move on, as he added: “El’s has been brilliant since he’s come in, he’s improving massively, absolutely massively. “From day one, he’s improved a hell of a lot, he’s got a massive future in the game, everyone can see that. But Tyles is unbelievable as I’ve seen it over the years, so it’s a hard one, but to have two keepers like that in the squad is a plus.